This laborious feat [of printing the world’s first Bible] was nothing short of audacious when considered against the backdrop of a church-controlled world that regarded such tampering as blasphemous…Christie deftly imbues its telling with the drama and intensity it demands. 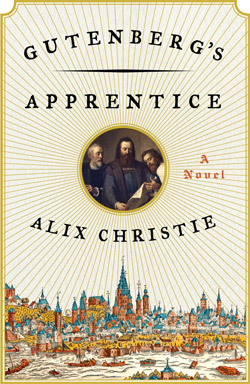 It’s surprising that Hollywood is yet to make a movie on Gutenberg and his press, and I hope Alix Christie’s richly imagined, finely researched and intricately plotted novel is the one that gets picked to be that long-wished-for movie…a rousing and beautiful novel. History buffs will savor the moment the inventor, the scribe, and the merchant make a decision that leads them out of the Middle Ages into the Renaissance….a meticulous account of quattrocento innovation, technology, politics, art, and commerce. An evocative, immaculately researched and superbly imagined novel. Finely atmospheric…a haunting elegy to the culture of print… One thinks of Donna Tartt’s THE GOLDFINCH or Philip Roth’s AMERICAN PASTORAL. Such novels of craft and specialization take a writerly delight in the most intricate details of a particular trade while spinning rich prose out of its mysterious threads. 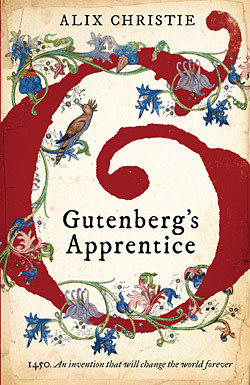 Alix Christie’s debut novel Gutenberg’s Apprentice brings to life the ruthless, secretive figure of Gutenberg through the eyes of his apprentice. A richly satisfying fireside read. I loved this novel. Alix Christie’s debut is intensely observed, so much that I felt in the dark rooms of history with the people laboring over the metal and words to bring us print, but also laboring over their own lives and love and survival. Susan Straightaward-winning author of “Between Heaven and Here" and “Highwire Moon"
A must-read for anyone interested in the ever-changing art of publishing.